If this year’s allotmenteering were the Pilgrim’s Progress, right now I would be squarely in the Slough of Despond. I went into the greenhouse last night and discovered I have blight. Everywhere. Each plant is now up to 5 trusses, but they are mostly still in flower. I’ve taken off as many of the tainted leaves as I can find, and am crossing my fingers and toes that that will do the trick. At this time of year greenhouses are not supposed to look like this. I have a horrible feeling in the pit of my stomach that all my heritage toms are kaputt. It was right about the referendum and the election, so why not this? I am gutted. There may have been a small cry. 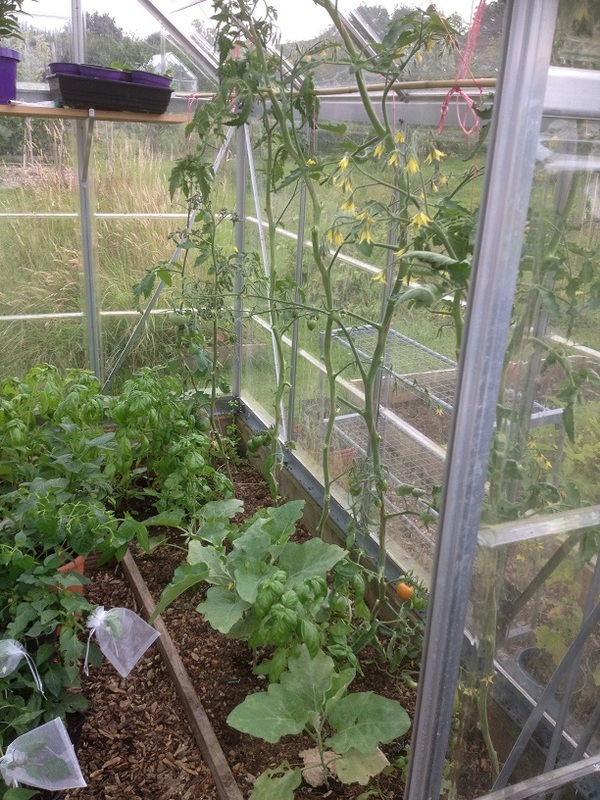 However, if the tomatoes are not to be, then all the chillies can come back into the warm and I will make the best of it. 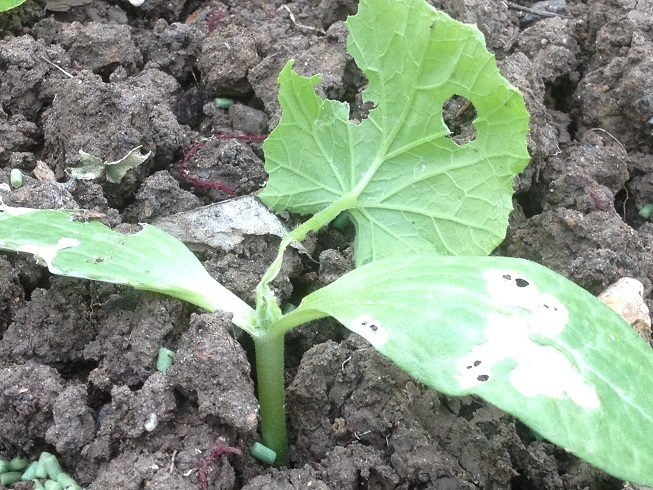 Slugs have eaten all but one of 13 squash plants I put out the other night, despite hardening them off, using pellets and nematodes. Mostly there aren’t even stem remnants left. 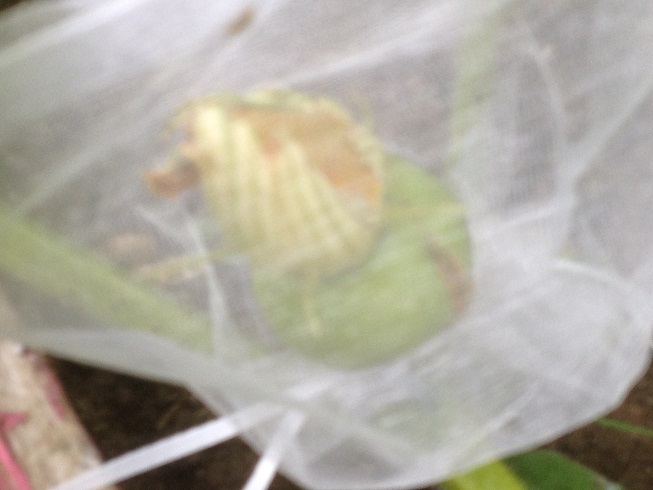 I’ve also learned that if I don’t bag every baby squash slugs will eat them. I can’t believe how many plants I’ve put out this year. Something is eating the chillies and sweet peppers, either on its way out or on its way in. Each one has a small hole at the top. So perhaps these need bagging too. I’ve bought some fleece from the £1 shop to sew bags big enough to tent the plants. Right now I am experiencing the ‘joy’ of hand-weeding: gritting my teeth and going through a bed chock-full of tap-rooted buttercups, nettles, hairy bittercress, forgetmenots and, my personal favourite, horsetail. It used to have strawberries in – but they are so old they appear to have re-alpined themselves. 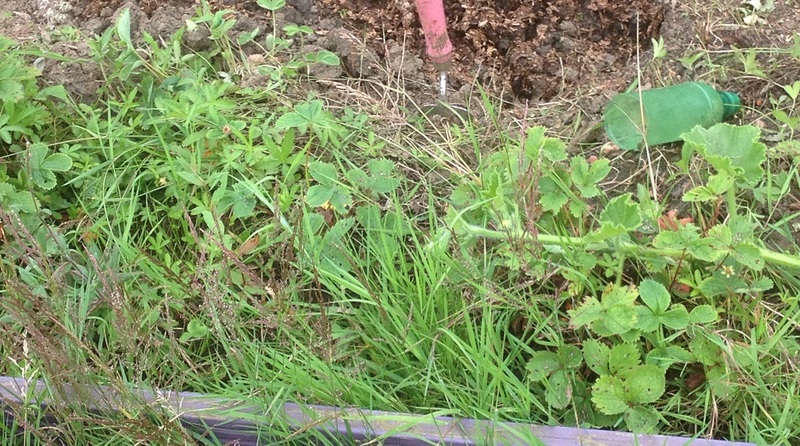 The berries are tiny and pippy so the plants are going on the compost. As soon as there is enough space free, something is planted. In this case a spiny kiwano which I hope the slugs choke on. Oh, and the garlic definitely has onion white rot. 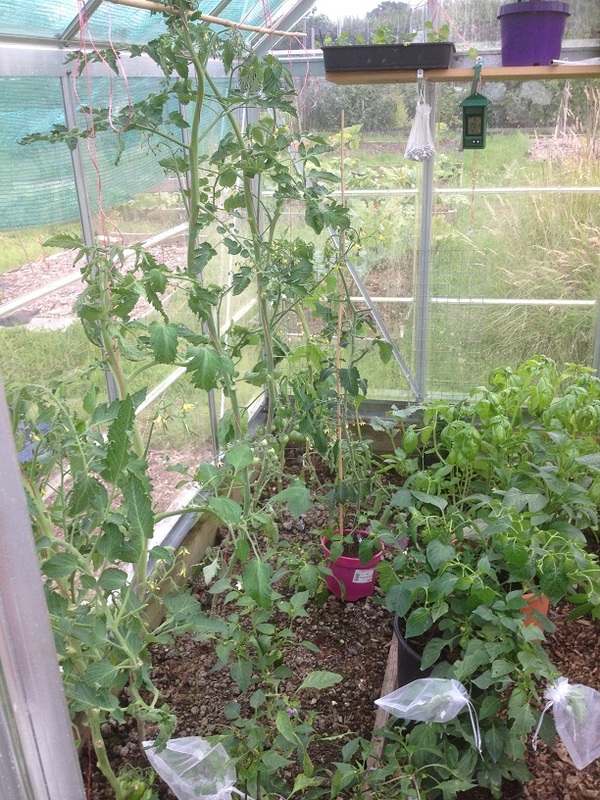 One small cheery note, after much clamouring from us, someone on the Grow Your Own forum has built a slug trebuchet. It’s genius! Oh no 😦 Hope you’re able to salvage the tomatoes. If not, I’m sure their loss will be the chillies gain. Thanks – am crossing all my fingers that they will make it through. It’s still only on the leaves. If I were Beryl what would I do? I would first head over to auto parts and find a bag of oil-dry that has a main ingredient of diatomaceous earth. Or wherever you can find locally..Spread a ring around each plant. Microscopically the DE is like shards to the slimy soft bodied crawlers as they make their way to the stem to destroy it, they find their selves sliced and diced. Baiting with cheap sudsy beer might be an option as well since they are as attracted to the brew as a 20 year old male . 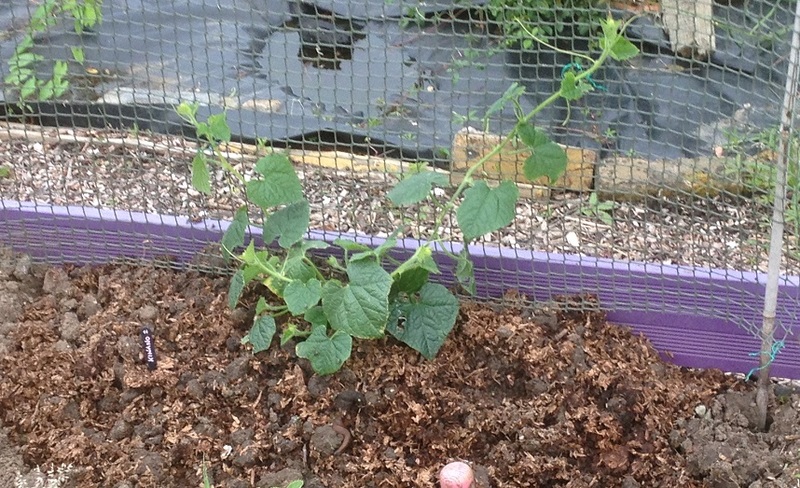 If it makes you feel any better I am on my seventh planting of bean seedlings….slugs are winning at the moment. Ouch! I gave up after 3 – you have demonstrably more staying power!! I hope they leave at least some of those alone. I feel your pain. I had a good moan on a recent posting and had lots of similar stories in return. You’re not alone! Gutted for you Beryl. But for what it’s worth you clearly have the skill to turn it round and with some creative planning will get good crops before the year’s out I’m sure. And cossetting the quinces for my brandy/jelly future.